Roof repairs versus a new roof is a big decision. We're all so busy and unlike our cars that we listen to every day we drive, we seldom look at our roof — we're running late when we leave the house and coming home, we're focused on what's next like making dinner. That means most homeowners don't regularly inspect their roof for damage. That's not good. Many home features will tell you when they've reached end of life — a light fixture stops working, the bathroom fan gets noisy or the freezer isn't keeping food frozen. You can't see most roofing problems — a shingle that's slipped leaving a gap, roofing cement that no longer has a tight seal around a vent stack or the roof deck (the plywood sheathing that supports your roofing layers) has wood roof due to a leak. You want to find and tackle small roof repairs before problems get bigger. With ongoing maintenance, you'll save money with fewer repairs and reach your roof's projected lifetime. There's good news for homeowners with unfinished attics. You can inspect your roof from the attic, by going up there with a flashlight. Leaks are visible long before a stain develops on the ceiling or wall below. These problems indicate roof repairs are needed and soon, to avoid mold. Outside light through your roof must be tested during daylight. We recently found a pinhole this way (you know the story about the cobbler's children) as our house is 4 stories and there's no easy way to climb up to inspect the roof. Dark lines or spots indicate water damage, i.e. where water leaks into the attic and follows gravity down (the lines) or where blocked, pools and wood rot (dark spots) starts. Changes to things in the attic like insulation (water will weigh it down) or the tops of boxes (wet you're using to store things. You're looking for signs of water in the attic and these problems may also produce an odor. Places where the roof is sagging are serious and roof repairs need to be done immediately. Many homeowners put off inspecting their roof until they take the ladder out for something else. While you're roof is fairly new (less than 10 years old), inspecting with binoculars or a digital camera is better than no inspection. The camera works well because you can blow up the images and see more detail and you can compare photos from year-to-year. Inspect shingles to see if they're cracking, curling (corners turning up), buckling (looks like something's underneath pushing up shingles) or blistering (granules on top are bubbling up), as these problems can indicate your roof shingles are reaching end of life, i.e. roof repairs can't solve the problem. Look for loose materials, signs of wear or gaps around your chimney, vent stacks, skylights and other things penetrating your roof surface. 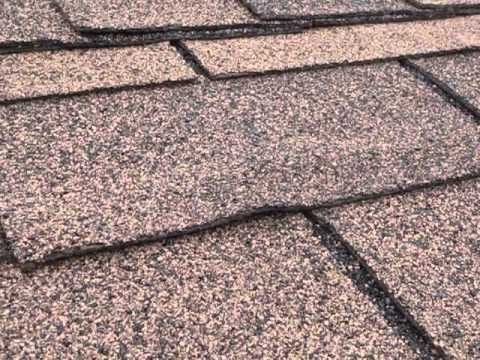 Look for excessive amounts of shingle granules in your gutters or bare spots on the shingles, as this means shingles are more exposed and vulnerable to the weather. When these problems are in found multiple places, roof repairs are only a temporary fix. Problems may be due to faulty materials, install problems, harsh weather or ventilation problems. Installing a new roof is complicated as you've got to apply materials in the right sequence, overlapping in the right direction — it's why roof repairs are challenging. Back to my handyman business and homeowners who didn't want to pay for a new roof. Many homeowners try to buy time with temporary roof repairs. We told one homeowner they needed a new roof but they only wanted temporary repairs, and shame on us … we didn't write that we wouldn't guarantee the repairs. Then they wanted us to fix the roof for free about 2 months later and we did. When we made the repairs, we had them initial on our invoice that we would not guarantee these roof repairs. Another homeowner converted their garage into a finished room, with a skylight that was leaking. They didn't want to pay for a new roof, so they only had us remove the skylight. 2 years later they called because the “roof was leaking” and expected us to make the roof repairs under our one year warranty. Fortunately we were able to show them the original roof estimate, which documented the problems, our explanation that they needed to replace the roof and the work we'd done. They'd gambled and lost, because their roof had exceeded it's useful life. Temporary roof repairs may allow you to delay getting a new roof by months and even a year, but once you make the first roof repair you should start saving for a new roof. Still not sure how to decide on roof repairs or a new roof? Watch the video above and you'll quickly see that where there's one roofing problem, there are others. That's because the roof deck below the shingles is the same, the shingles and other materials used and installation are almost always the same, so it's only a matter of time before similar problems keep popping up. Delayed roof repairs & learned the hard way? My wife and I have been trying to decide between roof repair and a new roof right now. We had a large storm blow through and I think it damaged the roof. It is a good idea to inspect the roof from the attic, I’ll have to go and do that. My roof is starting to sag and it’s concerning. Thank you for pointing out that this is a repair that we are going to need to get done immediately. I’ll have to look into finding the best roofer in my area to come and help us repair the roof as soon as possible.